TORONTO -- The Toronto Maple Leafs will have a very different look next season. General manager Cliff Fletcher continued the NHL team's off-season makeover Tuesday by signing forward Niklas Hagman and defenceman Jeff Finger to four-year deals while bringing back goaltender Curtis Joseph on a one-year contract. The signings were the latest moves in what has been a busy few weeks for Fletcher. Goaltender Andrew Raycroft and forwards Darcy Tucker and Kyle Wellwood are gone. Captain Mats Sundin is contemplating his future after hitting the unrestricted free agent market. Forward Jamal Mayers was acquired before the draft, where the Leafs traded up to get highly touted blue-liner Luke Schenn. And rumours continue to swirl that veteran defenceman Bryan McCabe might be moved. Fans might need a program to figure out who's on the ice in the fall. Fletcher, who's trying to rebuild a team that hasn't made the post-season since 2004, said the signings will help the team moving forward. Hagman, who signed for US$12 million, played in all 82 games for Dallas last season, registering a career-high 27 goals and 41 points. 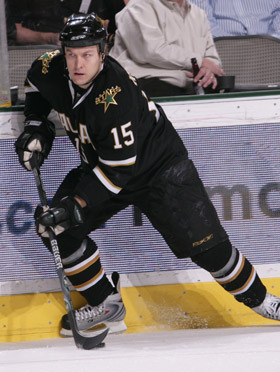 The native of Espoo, Finland, led the Stars with eight game-winning goals and four short-handed goals. ``We look forward to him bringing his speed, grit and scoring touch to our lineup,'' Fletcher said. Finger, who got a $14-million deal, spent parts of the last two seasons with the Colorado Avalanche. He had 19 points (7-12) in 72 games last season while earning the league minimum of $475,000. Fletcher said that Finger is a late-bloomer who made great strides last season. Joseph, who lives just north of the city, signed for $700,000. The 41-year-old enjoyed some of his finest seasons in blue and white, twice leading Toronto to the Eastern Conference final between 1998 and 2002. He left the Leafs six years ago but returns to serve as Vesa Toskala's backup. Joseph sat out most of last season before signing with the Calgary Flames and putting up a 3-2-0 record in nine appearances. He also got into two playoff games. Joseph has appeared in 922 NHL career regular-season games for St. Louis, Edmonton, Toronto, Detroit, Phoenix and Calgary. He has also played in 133 career playoff games. Finger has 24 points (9-15) and a plus-22 rating in 94 career NHL games. New Maple Leafs head coach Ron Wilson said Finger made big strides last season. ``He might have been the defenceman in the Western Conference who improved the most from the beginning of the season to the end,'' Wilson said. Fletcher said there was nothing to report on the Sundin front. Several teams are interested in his services but he's weighing his options in his native Sweden. The 37-year-old Sundin has spent the past 14 years in Toronto and is the franchise leader in goals and points. He had 32 goals and 78 points in 74 games last season. Fletcher added he hopes to sign another defenceman in the next day or two.